Rava praised Rav Sechorah to Rav Nachman as a great man. [Rav Nachman] said to [Rava], “When he comes to you, bring him to me.” [Rav Sechorah] had made a vow he wanted to annul. He came before Rav Nachman [to be released from his vow]. [Rav Nachman] said to him, “Did you make the vow knowing this [i.e., a particular fact]?” [Rav Sechorah] said, “Yes,” “Knowing this?” “Yes,” several times. Rav Nachman became angry. He said to [Rav Sechorah], “Go away!” Rav Sechorah left and made an opening for himself: “Rabbi said: What is the virtuous path that a person should follow? That which honors oneself and brings honor from others. (Pirkei Avot 2:1) And now that Rav Nachman has become angry, knowing this, I would not have made the vow.”—And he [found the basis for an “opening”] to annul it for himself. In TMT #37, we considered a passage from the tractate about vows concerning several cases in which people were absolved of their vows because conditions changed and they came to regret having made them. Generally speaking, this is shaky ground for absolving someone of a vow since anyone requesting annulment certainly regrets having made the vow, and only hindsight (never foresight) is 20/20. No wonder the Rabbis adjure us never to avoid making vows! But reality being what it is, people are quick to utter rash statements, often formulated as vows, without due consideration. The Rabbis are therefore caught between a rock and a hard place: It serves no social or religious purpose to hold people to foolish and counterproductive vows. Yet on the other hand, releasing them automatically renders all vows meaningless and has implications for other obligatory or promissory statements a person might make. Keeping our word and trusting others to keep theirs are important for everything from casual social relationships to far more complex relationships, and vows are serious utterances that should be treated as such. Therefore, the Rabbis search for a petach (“openings”), meaning grounds upon which to annul the vow. They often ask, “Did you know…?” to determine if grounds can be found to annul a vow on the basis of an after-the-fact event that would have been a game-changer. Our passage contains an anecdote about Rav Sechorah, who seeks the help of Rav Nachman to annul a vow he has made. In preparation, Rava tells recommends him to Rav Nachman, saying that Rav Sechorah is a great man. This seems a strange and unnecessary detail to add. There are two grounds upon which Rav Nachman can make an petach (“opening”) for Rav Sechorah: (1) Ta’ut (“mistake”)—If Rav Sechorah never intended to make the vow and uttered it by mistake, or if he made the vow without intending to do so; (2) Charatah (“regret, unsettled mind”)—If Rav Sechorah made his vow impetuously, or in a state of anger. If Rav Nachman can ascertain that at least one of these conditions applies, he can convene a bet din (court of three) and retroactively annul Rav Sechorah’s vow. Rav Nachman attempts to find an “opening” on which to annul Rav Sechorah’s vow. He cites a fact or event that occurred as a result of the vow that, had Rav Sechorah known or foreseen, he would not have made the vow. Rav Nachman asks, “When you made the vow, did you know this?” Rav Sechorah does not say, “No,” as we would expect (and as Rav Nachman hopes). He says, “Yes.” Rav Nachman asks several more questions, each designed to elicit grounds for annulment, and each question, Rav Sechorah honestly responds that he knew or had considered what Rav Nachman proposes. Rav Nachman grows annoyed. In fact, he becomes angry and sends Rav Sechorah away. If Rav Sechorah is as great as Rava claims, how could he have made a vow so foolishly and now expect Rav Nachman to find an opening to annul it? Rav Nachman’s inability to find an “opening” ironically provides Rav Sechorah with the opening he needs. Talmud explains by recounts Rav Sechorah’s reasoning to himself: R. Yehudah ha-Nasi taught us in Pirkei Avot 2:1 that the virtuous path in life is one in which a person does what is honorable and earns the honor of others. Causing Rav Nachman to become angry with me concerning the vow I made was certainly not an outcome I foresaw or desired, and had I known that this would result, I would not have made the vow. Rav Sechorah has found an opening for himself: He did not realize that the attempt to annul his vow would provoke Rav Nachman’s anger; had he known, he would not have made the vow, which he now deeply regrets. He has found the “opening” upon which Rav Nachman now annuls his vow for him. The Bible does not permit the annulment of vows (with the exception of the authority of a husband or father to annul a woman’s vow on the day it is made; see Numbers 30:4-16). Consider the consequences in the case of Jephthah (Judges 11:30-40), the general who leads Israel in war against the Ammonites, vowing that if he returns victorious he will sacrifice the first thing he sees upon returning home; his daughter, coming out to greet him, is the first thing he sees. In formulating a way to retroactively annul vows, have the Rabbis undermined or repaired the Bible? Throughout Jewish thought and literature, the theme of the power of words arises again and again. Torah begins on this note: God created the universe through speech. A neder (vow) can only be made concerning an object that one declares forbidden to him/herself. Can you imagine a rash vow that would create havoc in a person’s life and in the life his/her family and friends? Why do you think the Talmud makes mention of Rava’s praise of Rav Sechorah to Rav Nachman? Would this have influenced Rav Nachman’s expectations of Rav Sechorah and hence his reaction to what Rav Sechorah tells him? How does our view of Rav Sechorah as a “great man” work to legitimize the opening he finds for Rav Nachman to annul his vow? A certain person came before R. Assi, who said to him, “Have you already regretted [your vow]? He said to him, “Haven’t I?! [meaning: I certainly have! ]” So [R. Assi] released him [from his vow]. A certain woman imposed a vow on her daughter. [The mother] came before R. Yochanan. He said to her, “Had you known that your neighbors would say about your daughter, (22a) ‘Had her mother not seen in her matters that warranted abandoning her, she would not have made the vow for no reason,’ would you have imposed the vow on her?” [The mother] said to him, “No.” He released her [from her vow]. Do you know people who make promises but do not keep their word? For inconsequential issues, we can turn a blind eye, but for important matters, we are inclined to “put it in writing.” Long ago, agreements were often contracted orally by taking an oath. Vows had legal validity and consequences. Torah uses two terms: If a person makes a neder (vow) to Adonai or takes an shevuah (oath) imposing an obligation on himself, he shall not break his pledge; he must carry out all that has crossed his lips (Numbers 30:3; see also Deuteronomy 23:22–24). The distinction between a neder and a shevuah is that a neder prohibits an object to the one who makes the vow (although Torah permits it), while a shevuah obligates or constrains the behavior of the person who makes the oath. Our passage concerns vows. For example, if I vow not to eat unhealthful food for a month, then junk food is now forbidden to me. To be enforced, a neder requires both intention and a verbal declaration (just thinking it is not sufficient). The Rabbis took people’s pledges seriously. Life and death are in the power of the tongue (Proverbs 18:21). What happens when someone is too quick to make a vow, failing to recognize its consequences, or if the consequences are unforeseeable? Torah does not provide a mechanism to absolve people from their vows. The most tragic example is the general Jephthah (Judges 11:30–40) who leads Israel in war against the Ammonites after foolishly vowing that if he is victorious in battle he will sacrifice the first thing he sees upon returning home; upon his return, his only child, a daughter, comes out to greet him. It is a horrifying scene. The Rabbis attempt to balance the ideal with the real. They understood that making rash vows is part of human nature and therefore they strongly discouraged people from making any vows whatsoever, and further built into halakhah mechanisms to annul rash and inappropriate vows. Generally, either a rabbi or a bet din of three knowledgeable lay people can have a vow annulled (called hatarah) if there exist grounds for a petach (“opening”), which means that the person regretted the vow because they were not aware of the affect it would have on them. Our passage provides three examples of finding a petach to release a person from their vow. Our passage has three brief stories. In the first vignette, R. Assi finds a petach (“opening”) to annul a man’s vow because he regrets having made it. In the second vignette, R. Elazar releases a man from his vow because he made it rashly in a moment of anger; the anger “coerces” him into making the vow. In the third vignette, a woman unknowingly and unthinkingly digs herself into a hole by vowing that her daughter will derive no benefit from her (the mother). We can only imagine what transpired between mother and daughter to inspire the mother to make such a rash vow. The result, however, is not surprising. The neighbors begin talking, as people are wont to do: “Wow! Did you hear about So-and-So’s vow regarding her daughter? Her daughter must have done something spectacularly awful for So-and-So to have made that vow!” The mother is horrified that many people in her community now presume that her daughter has done something so terrible that it is appropriate for her mother to essentially abandon her. She goes to R. Yochanan in the hopes that he will retroactively annul it. He asks the mother whether she realized that such damaging gossip would ensue from making the vow. She replies that she did not. This the petach (“opening”) he needs to annul her vow. In a moment of anger, have you ever declared that you would do, or refrain from doing, something (e.g., never speak with someone again, never enter someone’s home again)? Did you later regret your declaration? What might be the emotional and spiritual consequences of holding someone to a rash vow they made? G. K. Chesterton (1874–1936) argued in a famous essay, “A Defense of Rash Vows” (abridgment here) that modern people fear vows because they pose consequences we would prefer to avoid, but require of us self-discipline and responsibility. Do you agree? If the Rabbis disapproved of making vows because people so often make them rashly and later regret them, do you think they should have found a mechanism for retroactively annulling all vows automatically? Why do you think they did not? If a High Priest] ruled [erroneously] unintentionally and acted [in accordance with his errant ruling] unintentionally, he brings a bull [as a chatat (sin offering)]. This is obvious! Abaye said: What are we dealing with here? Consider a hypothetical case in which [a High Priest] ruled and afterward forgot the reason for his ruling, and at that time he erred and said, “I hereby act on the basis of my [previous] ruling.” You might have said that since had he known [his reason for the original ruling] he would have retracted, he is considered as one who acted intentionally and is not liable [to bring a chatat]. Learn from this [why the mishnah tells us he is liable to bring a chatat]. The tractate Horayot discusses errors in rulings made by the High Priest or the Sanhedrin that. Horayot concerns leniencies that cause people to violate negative (“thou shalt not…”) commandments serious enough to carry the punishment of karet (being cut off from the Jewish people) if committed purposefully. Given the priest’s or judge’s authority and influence, we can easily see why the first mishnah in Pirkei Avot reminds sages to, Be deliberate in judgment. But, as Rambam (Moses Maimonides) pointed out, “it is impossible for those with the nature of flesh and blood not to err”—or put another way: nobody’s perfect, not even a High Priest or members of the Sanhedrin. Although the most egregious violations of negative commandments carry the penalty of karet (excision from the community), there is a remedy if the sin were committed inadvertently: the person must bring a chatat (sin) offering to make expiation. Before explaining the passage above, we need to understand the mishnah to which our passage is responding. Let’s try to understand it first. The mishnah recognizes three cases: (1) A High Priest rules erroneously without realizing that he is wrong, and subsequently acts on his own ruling. (2) A High Priest rules erroneously without realizing he is wrong, subsequently realizes his mistake, but acts in accord with the erroneous ruling nonetheless. (3) A High Priest intentionally rules incorrectly and then acts on his own ruling but without intention to act on it at the time he did. In the first case, the High Priest can remedy the situation by bringing a chatat (sin offering), which Torah stipulates is brought for inadvertent sin (Leviticus 4:27). In the second and third cases, however, the remedy of the chatat is not available to him because of the intentional character of either his decision or his acting on the decision, and because the law follows the procedure for the case of erroneous rulings brought by the Sanhedrin. If your head is spinning, please hang on a little longer. The mishnah tells us that only in the case in which the High Priest’s erroneous ruling was unintentional and his acting on it was also unintentional, he brings a bull as a chatat to remedy the situation. Gemara says: Obviously! We know this from Leviticus 4:3 and 27, so why does the mishnah bother telling us what is obvious? Abaye explains that the mishnah articulates what seems to be an obvious case because it wants us to be aware of particular variation of the case that we might misconstrue: A High Priest makes an erroneously ruling, and subsequently forgets his own reasoning. When it comes time to act on the ruling, he relies on it although he has forgotten the reasoning. We might think, Abaye says, that had he recalled his original reasoning, he would have had the opportunity to revisit his thinking and possibly correct his error. But he didn’t; he went ahead and acted on the ruling without knowing the reasoning behind it. We might think, Abaye says, that this means his sin is intentional, but it is not, and that is why the mishnah states the “obvious”—to insure that we don’t misconstrue this case. Even with the best of intentions, people make mistakes. Any human system needs to make reasonable allowances for human error. But when are errors forgivable (the function of the chatat offering is to clear the one who brings it of guilt, but it only applies for inadvertent violations) and when are they so egregious that we ought not excuse them? Do you agree with Abaye’s analysis of this borderline case? We might say: The High Priest did not realize he had made an errant decision. Or, we might say: Had he forced himself to recall his reasoning before acting, he might well have caught his own error and corrected it; and if he could not recall his reasoning, he would have needed to reasoned the decision anew and would likely have made a correct ruling. We would hope that people in positions of authority and power would be encouraged to rethink their decisions, and also to acknowledge their errors and correct them. Do you think Abaye’s case does either or both? Could Abaye’s reason for allowing the High Priest in the hypothetical case to bring a chatat be that he is giving him the benefit of the doubt? R. Simon b. Yochai was asked by his disciples, “Why didn’t the manna come down to Israel once each year?” He replied: “I shall explain by a parable. This may be compared to a king of flesh and blood who had one son, whom he provided with food once a year, and so [his son] would visit his father [only] once a year. Thereupon he provided his food every day, and he visited his father daily. So, too, Israel. One who had four or five children would worry and say: ‘Perhaps no manna will fall tomorrow, and everyone will die of hunger.’ Therefore, everyone directed their hearts to God in Heaven.” Another interpretation: They ate it while it was still warm. Another interpretation: Because of the weight of carrying it along the way. I am including the Talmudic text in addition to a translation this week because it is written in relatively simple Hebrew. For those who enjoy the Hebrew, have fun! One week after leaving Egypt, the Israelites find themselves at the shore of the Reed Sea. We recount their harrowing crossing and the miraculous redemption they experienced on the seventh day of Passover. Six weeks out of Egypt, the people complain of hunger—they experience severe food insecurity. God responds by raining down manna from heaven each night; the people find it covering the ground when they awaken in the morning. Since they are prohibited from gathering manna on Shabbat, God provides a double portion on Friday morning (the two loaves of challah on the shabbat dinner table Friday night recall the double portion of manna). Israel’s complaints and grumbling are generally viewed negatively by both the Torah and the Rabbis—evidence that the people lack faith in God to protect them, even after the miracles of the Ten Plagues, the Exodus, and the Parting of the Reed Sea. Occasionally, however, the Rabbis evince a refreshingly compassionate view. R. Shimon b. Yochai’s students wonder why God provides manna daily, rather than once a year. At this time of year, we are tempted to compare manna with matzah, since year-old matzah tastes pretty much the same as new matzah: it starts out tasting stale. If it makes little difference, why does God go to the trouble to provide it daily? Talmud supplies three possible answers. The first answer, from R. Shimon b. Yochai, comes in the form of a mashal (parable or allegory). Parables abound in rabbinic literature. To decode them, we need to know that the earthly king is always a stand-in for God, and the son or servant is always a stand-in for Israel. The king (God) owes his son (Israel) support—note there is no question about that—and sends a yearly allowance. The result is that the son visits only once a year. Rethinking the plan, the king gives his son money every day and discovers that as a result, the son visits each day, if only to collect his allowance. Note there is no criticism of the son for visiting but once a year when the money is provided on a yearly basis. However, the frequent payments provide an opportunity for father and son to visit with one another frequently, reconnect, and maintain a close relationship. This is what God wants with Israel: close and frequent contact. We are given two other possible responses to R. Shimon’s students’ query. Perhaps God provides manna daily so that it will be fresh and warm when the Israelites eat it each day. God wants to provide them not only nourishment, but pleasure in eating. Or perhaps God provides manna daily because otherwise the Israelites would have to haul many months worth of manna as they traveled. This would be a weighty burden to shlep through the Wilderness. God wants to lighten their load. All three responses posit a loving God who is not resentful of the Israelites’ “grumbling.” In this snippet of Talmud, the Rabbis view the Israelites’ fear of starvation as first and foremost an expression of concern about their children’s health and welfare. 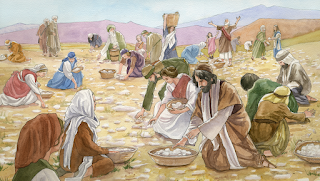 God does not respond with resentment (“Okay, here, have some manna and quit kvetching!”) but rather with thoughts of how the manna could be delivered to strengthen the bond between God and Israel, provide them with enjoyment (not just nourishment), without compounding the burden of journeying through the wilderness. There are often two ways to view, and even or interpret, what people say: The not-so-generous way is to accuse the Israelites of lacking faith in God. In our passage, the Rabbis demonstrate the generous way. When have you had a choice to interpret an event or conversation generously or not-so-generously? Which did you choose? How important is it to you to feed your family and guests tasty and enjoyable food? Why? God no longer rains down manna to feed hungry people. At the Passover seder, we say, “Let all who are hungry, come and eat.” Food insecurity is a terrible scourge found not only in far corners of the world, but far closer to home. Please learn more at the website of MAZON: A Jewish Response to Hunger and consider making a donation—you can provide much-needed manna to hungry people.